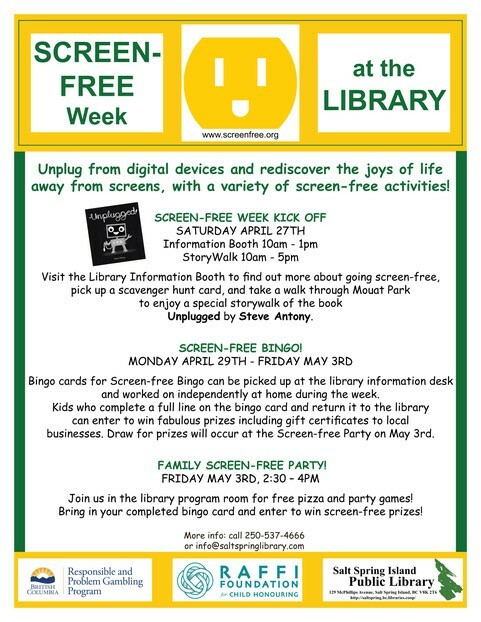 Screen-Free Week is an event where kids and families pledge to unplug from their electronic devices such as computers, video games, iPods/iPads, cell phones, and TV’s for the week and explore activities that promote social, physical, academic and creative development. During Screen-Free Week, kids, families, schools, and communities reconnect with the world around them. An hour that was once dedicated to TV can become an hour of make-believe, art, reading, or enjoying nature. Participants can use this week to reconsider the value of screen-based entertainment in their lives and establish year-round screen-free habits. 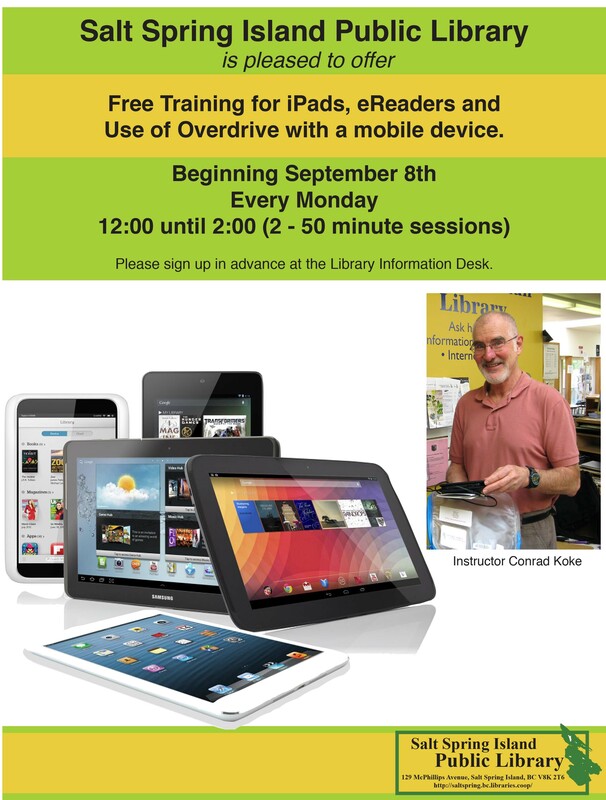 There’s no limit to what you can do during Screen-Free Week! Let your imagination run wild! 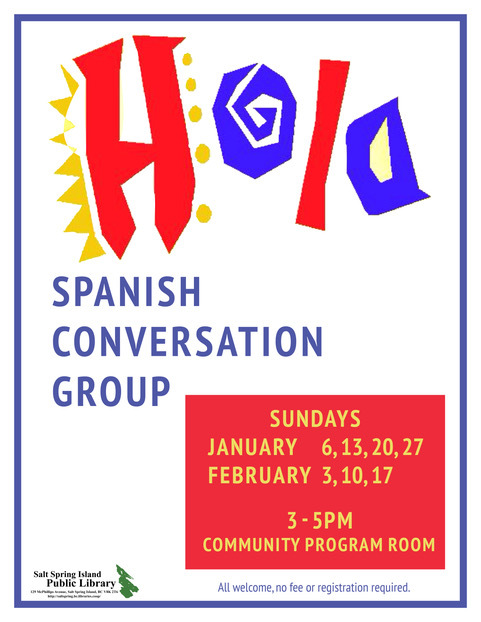 This free event is a chance to chat with other Spanish speakers or learners in a fun and relaxed atmosphere. 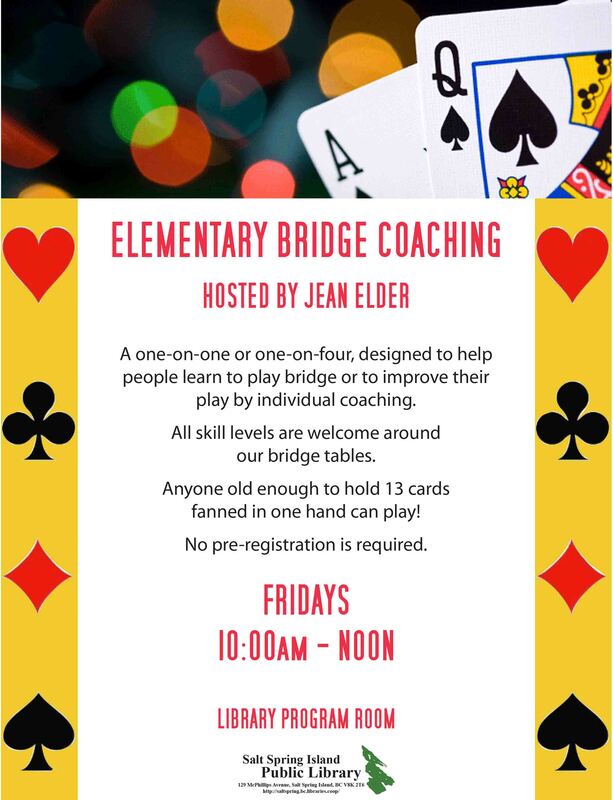 Those who want can join in learning and singing a Spanish language song or two. 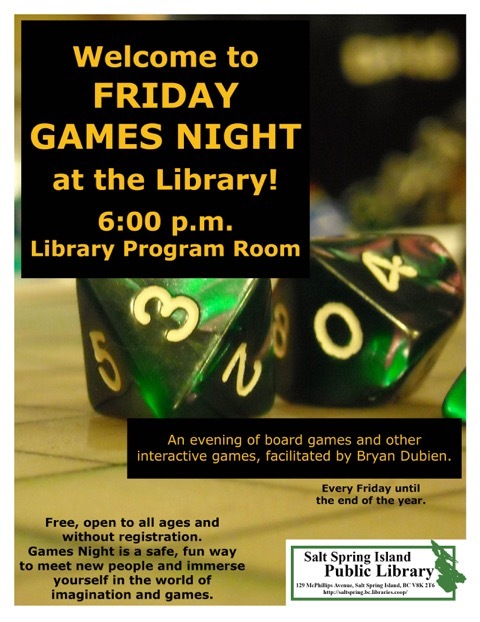 Refreshments and treats provided! There’s an online group for the meetup at https://app.agorakit.org/groups/146 that includes a calendar where you can see upcoming meetup dates, https://app.agorakit.org/groups/146/actions. If you register on that site you can join the group and participate in conversations. ¡Hasta pronto! 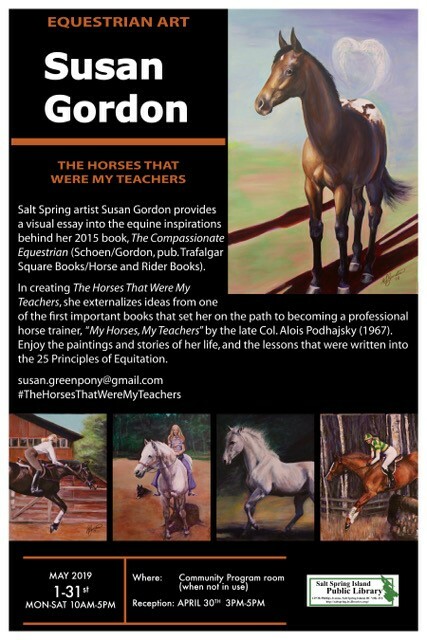 Salt Spring artist Susan Gordon provides a visual essay into the equine inspirations behind her 2015 book, The Compassionate Equestrian. In creating The Horses That Were My Teachers, she externalizes ideas from one of the first important books that set her on the path to becoming a professional horse trainer, “My Horses, My Teachers” by the late Col. Alois Podhajsky. Enjoy the paintings and stories of her life, and the lessons that were written into the 25 Principles of Equitation. Student position for a Children’s Summer Programs Coordinator. 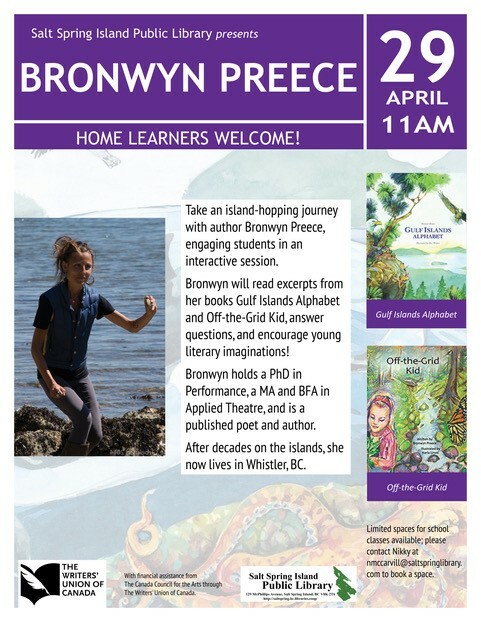 The library is offering free one-week passes to the Robert Bateman Centre and Royal BC Museum and Art Gallery of Greater Victoria. Check out our newest additions to the library catalogue. The library has a 86-seat program room which is available for the public to use. 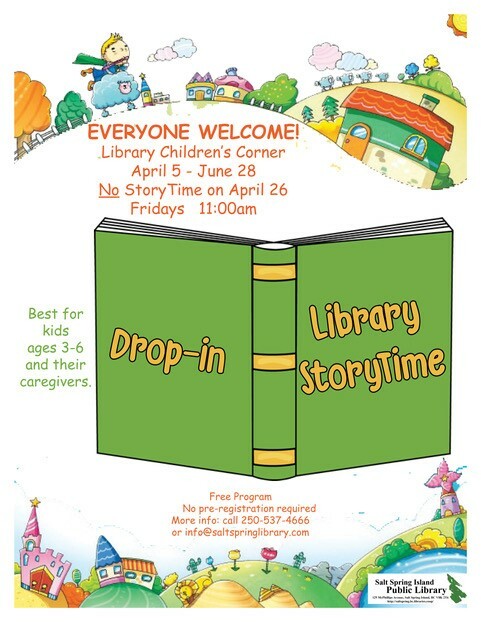 Please contact admin@saltspringlibrary.com or 250-537-4666 for more information or to book a room. Download the Program Room Policy and Application. 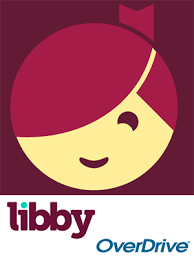 The library has two 8-seat meeting rooms which are available for the public to use. 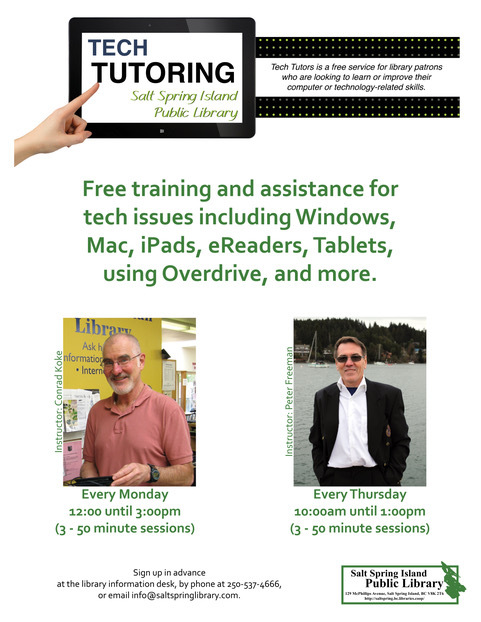 Please contact info@saltspringlibrary.com or 250-537-4666 for more information or to book a room.